In a world that is increasingly at odds with itself the Angel Tarot cards act as guides, almost like a spark of light during dark times, enabling you to find your way amidst confusion. With lively imagery and stunning colors, artist Arturo Picca reveals a diverse collection of angelic beings in Tarot of the Angels . From winged guardians to playful cherubs, demonic entities to humble servants of humanity, a myriad of ethereal agents find expression in this themed tarot deck. 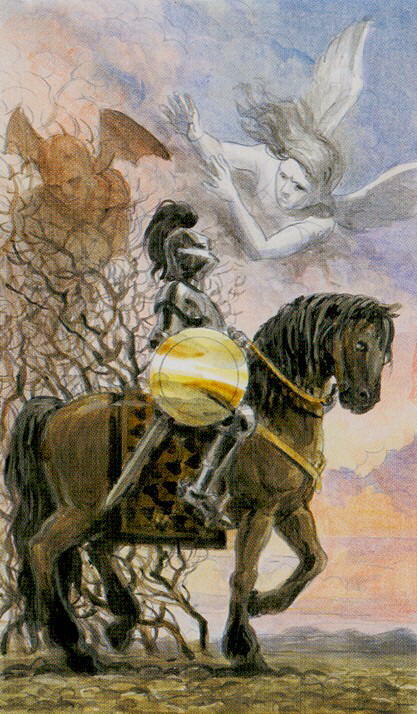 The knight of pentacles is wearing full plate armor. At the rear of his horse, a dark angel hovers threateningly over tangled, barren roots. Countering this malign force, a white angel appears to be pushing back against the stagnant, twisted vines as if attempting to free the rider from a snarled state. This is an inventive way to portray overcoming inertia and shortsightedness (the knight's helmet barely has slits for the eyes) and illustrates the theme of duality found throughout this deck as divine entities of light and dark do battle over the human soul.